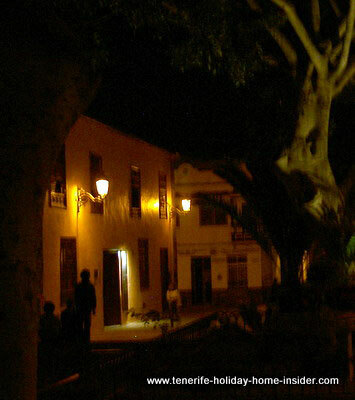 Romantic photo of Garachico in Tenerife at night. Discover Tenerife photos Garachico. A pretty church tower with an idyllic town square, a full moon, relaxing people, an excellent, historic town Hotel called Quinta Roja and an intriguing alleyway with many an old house lit up by dim lanterns play the part of a backstage of romance and tranquility. Outside Christmas decoration adds sparkle to the romantic mood. 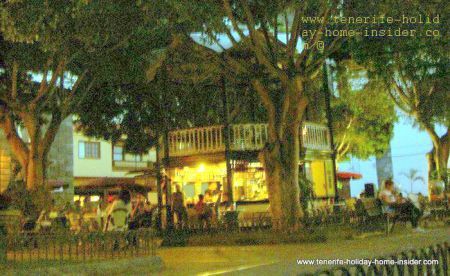 The romantic photo with moonshine by one end of Plaza Libertad Garachico beside sums up many photos of Garachico of dreamlike, quiet village life. The San Franciso convent, whose bell of a chapel swings gently in the ocean air is in the background of this moon lit square. Imagine a small town which is strikingly flanked by the Atlantic and mighty Mount Teide. The latter seems to rise like a steep wall in its back. Such closeness dictated the town's fate. The port was filled up with enormous amounts of lava in 1706. The heart of its commerce died a slow death with it. It took 1 and a half months. Now, the town by the Gara rock has its own flair. It's that of a quaint urban fairyland, as you can see. Vehicles don't seem to play a part. Enjoy its night scene like its locals by the picturesque town square without fear of crime, noise and pollution. Admire Plaza de Libertad and do your own Tenerife photos Garachico... See how filtered light gives all surroundings the soft touch. A central kiosk caters with snacks and refreshments to anybody who takes a seat by its round tables. Flower beds are everywhere under the Jacaranada trees. Shining stars and antique street lamps join an alluring night dance together with the seasonal led Christmas lights. 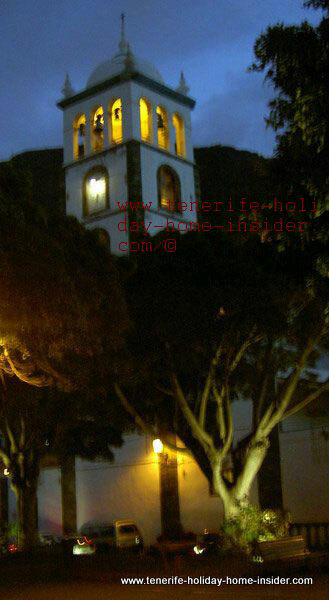 Belltower with magic light of Iglesia Santa Ana of Garachico. 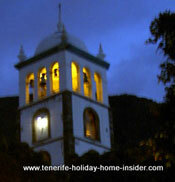 The church belltower of Iglesia Santa Ana also merits to belong to the set of Tenerife photos Garachico of romantic scenes. The tower nests behind ancient old Laural trees. Its picture book style illumination doesn't blend sleeping birds and casual walkers. Young lovers like to cross here when they walk from one part of the hamlet to the other. However, a tripod is needed to catch the furtive night bliss on camera. Tree decoration of Christmas Garachico town square. Certainly, the brass bells will call all to the festive Christmas mass or to any other event. Nearby, a led light tree decoration hangs from the branch of a lush Laural tree. it's not lit as yet. However, all the lanterns of the town square are working. Two young people are sitting below the tree and are rounding off the harmonic peace. 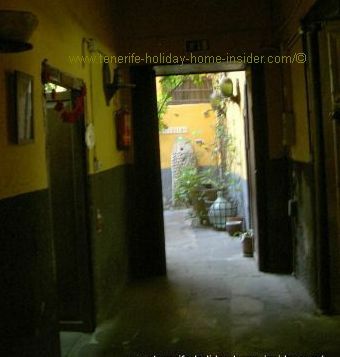 Spot the intriguing alleyway of Garachico near the Plaza which is pictured beside. It gives you yet another night panorama. Again, time and people seem to stand still. Discover it, while you sit by the central Pavillon of Plaza de la Libertad. Contemplate all that night romance which could be in a novel. See it from the breakfast veranda of a well known hotel whose several one story buildings frame part of the Plaza. ( square) This romantic hotel Quinta Roja Garachico is in the right place for poets and is perfect for any event where romance is the highlight. There is an intriguing former Garachico harbor house that dates back the Middle Ages. It has mesmerizing, high indoor patios and a somber, but romantic passage on its ground floor. It leads to a sunlit interior yard. Garachico is full of contrasts like that. Click through to find out more about this Restaurante Rocamar for enjoying seafood by good Tenerife cuisine. 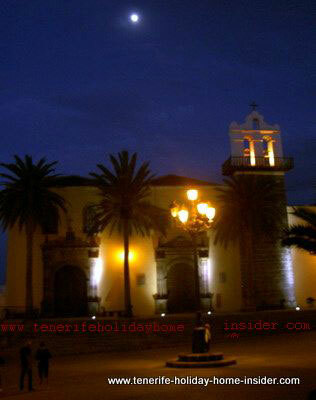 Romantic night photos La Laguna of Tenerife. 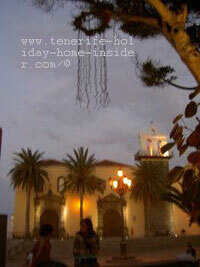 More about the quaint town Garachico on the Westcoast of Tenerife.